Irish music competitions sound like a nightmare to me, what with all the stories of young wannabe champions passing out and vomiting with the stress, and the bitter disputes over the scoring. Yet there are good things that come from it. One of these is the camaraderie and friendship between old sparring partners. Tom Dunne, my friend and session co-leader in New Jersey, is full of stories of exploits with his fellow contestants and subsequent buddies from competitions back in the day, in particular Seamus Walshe and Patsy Moloney. They have recently both albums which are well worth your attention. Seamus Walshe plays the box in a very personal style. In the liner notes of one of Seamus’s previous CDs Traditional Irish Music on the Button Accordion Joe Burke likened his approach to that of an architect (Seamus’ chosen profession). At the time, I considered that notion fanciful, preferring to just savor the luxurious experience of having that CD on repeat for a leisurely drive across the Canadian Rockies. Now I get the architect thing. There is definite evidence of a stately, elegant and logical form, yet lyrical and emotional touches abound. 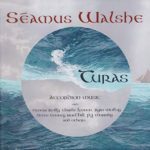 There are many examples of this on the new CD Turas: on the “Long Drop” Seamus shapes the first tune with phrasing and dynamic subtleties; as Eimear Reilly’s fiddle comes in for “Fred Finn’s Reel”, the stricter tempo and the “sit up and beg” figures enhance both the swing and the sadness in the tune; “The Torn Jacket” works as the release with a more straight-ahead approach (albeit with outstanding unison triplets). The strong windswept melody of “Margaret’s Waltz” is stated with bold accordion and fiddle lines, leading into “Louis’ Waltz”, a staple of New York sessions (also known as “Dermot Grogan’s Favourite”). Here it is given a totally different treatment with the harp, fiddle and accordion creating a dense texture with the fiddle adding harmonic variations. The Poppy Leaf is another commonly recorded tune (twice by Tony DeMarco , and a stunning interpretation by Brian Rooney) which still gets a fresh treatment by Seamus and Grainne Hambly on harp. They take a relaxed pace, resisting the temptation to stuff the high part with notes, and smoothly transition into Charlie Lennon’s Rossinver Braes with its exquisite interplay of box and harp. Turas means trip or pilgrimage and this album echoes that reflective note. 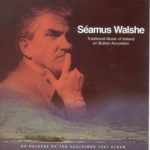 While it doesn’t have some of the exuberance of Seamus’ previous recordings it is an album of great sensitivity and maturity. It is also noteworthy that he has brought along some famous musical friends for this particular journey, including Alec Finn, Charlie Lennon, Noel Hill and Steve Cooney.